I love summer!! Not only do I love the warm weather but I feel like I can tackle my mile long DIY to do list and finish it in only a day! That never happens...but I do check items off and add new ones! 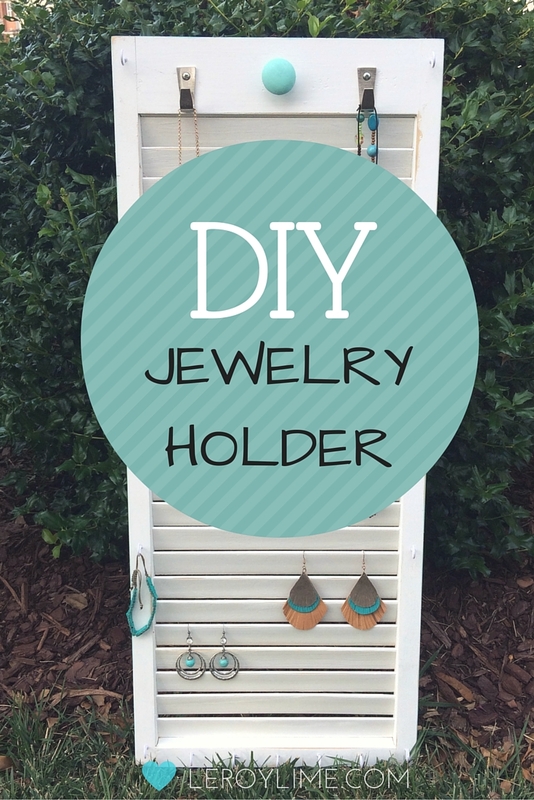 My latest DIY is this jewelry holder that I made for our neighbors teen daughter. I've been helping make over her room and she needed a place to put all of her pretty baubles instead of the top of her dresser. The shutter was FREE, can't beat that! It's actually half of a folding shutter door that we removed from our laundry room closet area. The doors were never shut and the laundry room closet is pretty enough to leave exposed, so we removed the doors and hardware. The other half of this door, I have on our mantle. I quickly took a sander and roughed up the edges a bit for more of a chippy paint look and then painted the wooden knob, that I kept when I cut the door in half, and the entire edge with two coats of chalk paint. I drilled three holes on the larger top section of the door to add three door knobs but when screwing one of them in, it broke...it happens...oh well, I had just finished organizing my hubby's tools in the garage and knew I had a few hooks left over from an IKEA haul, so I added those instead. The only purchase I made for this project was a box of white cup hooks that I predrilled before screwing in. The ones on the sides I placed at 12 inches apart to allow for necklaces to hang. The bottom row is great for bracelets or more necklaces and the middle portion of the door, is the perfect spot to keep earrings untangled and paired together. 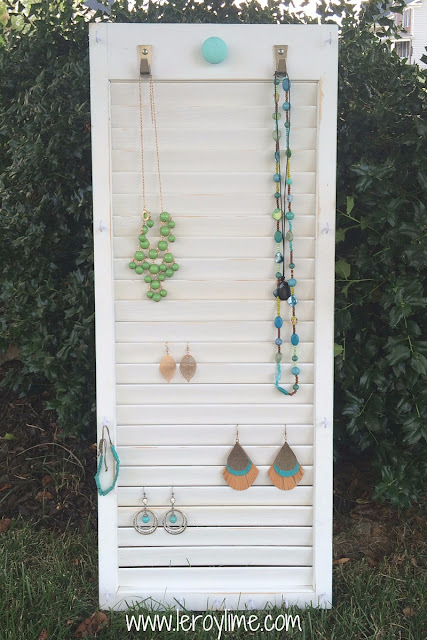 I attached a large hardy picture hanger hardware on the back and can now say that this jewelry holder is feeling glamorous and is so happy not sitting in the wood pile in our garage. 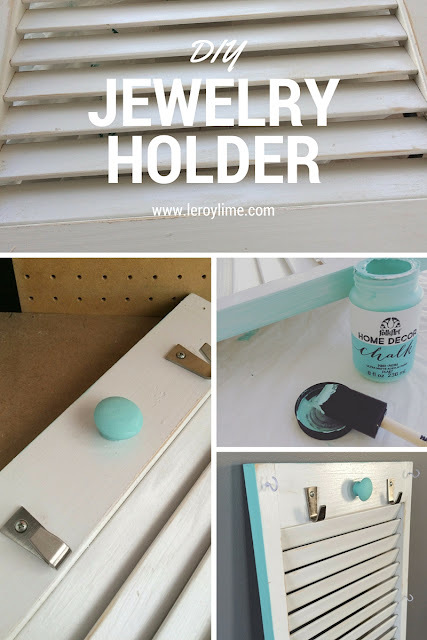 Wow I love this cute idea to hold jewelry and you did a great job making it! Thanks for sharing at C&C w J&J. 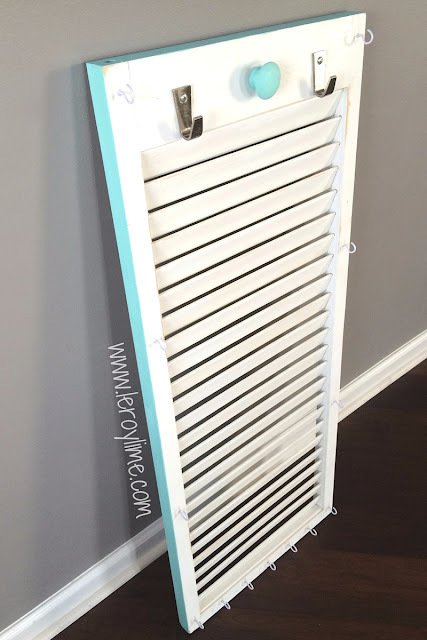 What a cute idea and I love re-purposing items! Cute idea for a jewlery holder! Thanks for linking up at Welcome Home Wednesdays! Hi Dawn! Love how the earrings hang on the shutters! What a great use of the old door. It looks wonderful as a jewelry holder. Pinning. Thanks for sharing at Snickerdoodle Sunday.